Life works in mysterious ways - sometimes you have to beg for a dismissal while at times a wicket comes out of nowhere. Today, Pat Cummins was so unlucky that a ball took an inside edge and hit the pads before being taken cleanly by Bhuvneshwar Kumar, but a bump ball confusion left India in doubt. The thing with this sport is you never know when the fortune will turn and if that was for good or bad. Just wait for the opportune time and it will come in a way that you never have imagined. Or at least, Bhuvneshwar Kumar had not imagined that he would be able to send Pat Cummins packing despite having a bump ball. 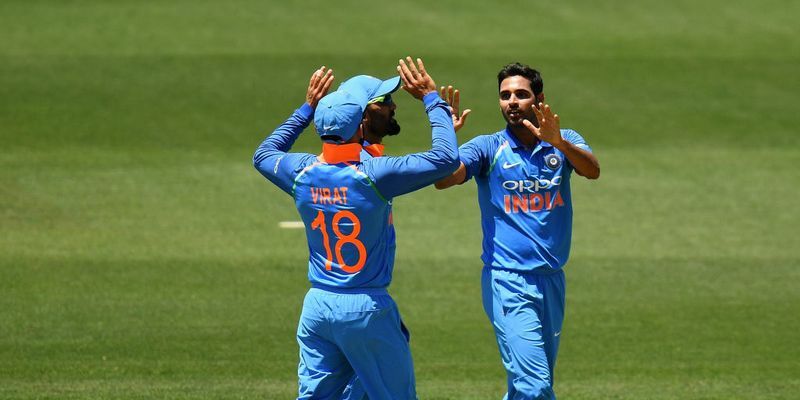 On the third ball of the 49th over, Bhuvneshwar Kumar bowled a full ball which angled into Cummins, who was cramped for room and had to jam the ball down the track. Kumar was alert enough to take the return ball cleanly, but he first thought that it was a bump ball came off the surface. In confusion, the pacer gave a bewildered look to the umpire and asked if it was a wicket, and even before the umpire could go back to the third umpire, Virat Kohli also gestured that it was an out despite having an under-confident look. When the third umpire checked the replay, he found out that there was an inside edge onto the pad and the ball straight away took the aerial path to Kumar’s hands. It was a no-brainer for the umpire as he signalled Cummins out, leaving the commentators in awe.